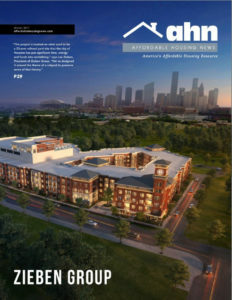 A landmark redevelopment project in a former railyard on the edge of downtown Houston represents the city’s largest investment in affordable housing to date. The Zieben Group is developing the Residences at Hardy Yards with the help of its partners, the Houston Housing Finance Corporation and the City of Houston’s Housing and Community Development Department. Hardy Yards is a class A project which will bring 350 mixed-income work force housing units to the market. It’s a product that hasn’t yet been seen in Houston, says Lee Zieben, the firm’s President. “It’s an opportunity to give people that make on average $45,000 a year, access to a higher quality class A workforce housing in downtown Houston, where current market rents are at all-time highs,” he says. The architecture of Hardy Yards will celebrate the site’s industrious past. Some of the aesthetic elements of the development’s design seamlessly blend in with the community’s history and its present surroundings. The Zieben Group tapped the property management company Greystar to handle the operations of Hardy Yards. The firm will ensure it remains in compliance with the relevant affordable housing regulations. A variety of amenities will await Hardy Yards’ residents upon the development’s completion. A concierge service, trash pickup, home automation in the units and a demonstration kitchen are just some of the unique features the community will offer. “The demonstration kitchen is a nice, upscale kitchen where residents can have cooking classes and cooking demonstrations with a back drop of the downtown skyline,” Zieben says. Additionally, the community’s rooftop clubhouse, located on top of the seven-story parking garage, will feature various modern, urban features. “It has an outdoor lounge area with an infinity pool overlooking downtown,” Zieben says. Active residents will enjoy on-demand fitness classes, a horseshoe pit, volleyball court, dog park and a bike storage room. The community is located close to the newly created hikeing and biking trails near the city’s downtown. Bringing Hardy Yards to fruition required Zieben and his team to diligently pursue the opportunity for several years. Zieben says that despite broad support for Hardy Yards’ redevelopment, finalizing the construction’s cost has proved time-consuming and challenging. “The idea came about in 2013, but with the project being so large and complicated, it has taken a long time to get off the ground,” he says. Market conditions have also slowed the community’s $67 million development trajectory. According to Zieben, damage to the city caused by Hurricane Harvey will further complicate the project, but the firm remains committed to seeing the development through. “We’re now in the hurricane, which could cause more potential delays and changes in cost, which we will work through” he says. Of The Residences at Hardy Yards’ 350 residential class A units, 179 will be affordable workforce housing targeted to at Houstonians who earn $40,000-$50,000 per year. The remaining 171 will be market-rate housing opportunities aimed at professionals who work in and around downtown Houston. Zieben Group is the perfect firm to tackle such a monumental effort. The company is one of the region’s up-and-coming affordable housing developers, and it currently has roughly 1,000 residential units under various stages of acquisition and development throughout Texas and Arkansas. The vertically integrated team has more than a decade of experience creating high-quality housing products that meet many different needs. Hardy Yards represents Zieben Group’s largest development effort to date and highlights the firm’s ability to successfully execute every aspect of the development process, from concept to lease up and stabilization. Although Zieben came up with the initial concept, he says, local leadership is playing a key role in its implementation. A diverse team of industry experts is responsible for Hardy Yards’ ultimate success.